Okay, so Pong is one of those games that gets brought up when people want to talk about politics in videogames. Pong, they say – they, who do I mean by ‘they?’ I mean the boring, tedious ding-dongs that make up the consumer base and harrassment core of Internet Conversations. There’s a sort of embarassing layer atop that where you have these people, these sort-of-journalists, who will try to talk about politics in videogames, with a first concession to, well, okay, Pong doesn’t have politics in it. First things first, Pong is a consumer product, distributed as a commercial entity. The game was designed to be approachable without any prior experience, for you to pay for that experience, and for that experience to be relatively brief so someone else could have a turn, or you could pay to continue your turn. It was an early coin muncher, and that plays into its design. That is, this game wanted to sell you an experience, and it wanted to sell you that experience in as small and discrete a packet of time as possible and with you leaving behind as little a mark as possible. There were no punch cards or memory assortments or memorising codes or time spent thinking and deciphering the procession or plan of a videogame, even though that tech could exist. The game was made to be transitory. Well, it was to maximise the number of people who would pay money to play it. Pong was designed to be short, instantly approachable, and to forget about you the second you stopped playing! The gameplay had to be as consumable as a beer – something you bought at a price point that seemed reasonable, and ideally you’d want to consume a lot of, but also not something that you should be thinking about or worrying about afterwards. What I’m saying here is that the fundamental design of Pong is political. It is play as a commercial product, as a capitalist entity. How did you get access to Pong? Back in 1972, you went to a place that had Pong. Pong was a thing that wanted to be positioned into spaces where people would go for leisure, but also wouldn’t stay. To make a home deliverable Pong device would involve a pre-existing network of game devices (and when they came along, Pong followed hard upon). When it started, though, Pong was in standup machines, and those machines needed to exist in spaces that had a certain population flow and that means they almost all connected to existing financial structures. They were games for adults, because kids weren’t thronging to specific structures in 1972 to hang out and spend some disposable cash, and that meant that early Pong showed up in bars. The flow of people, the way people travel around and move freely in their homes is intensely political, and if you don’t think the flow of people is political you might want to explain what immigration and interstate travel are, then. Oh, and Sundown Towns. 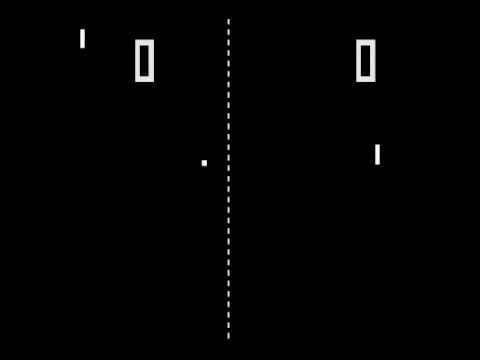 Yep, they were still a thing – officially – just three years before Pong. If you don’t think that the ability to freely move around your town to go to gathering spaces is a political act, well, hi and talk to some people of colour sometime, maybe? What this means is that Pong existed at a space people could already travel to and hang around. Which means that Pong, the game, was for a capitalist space of those free to move and who could travel without expecting to be excluded for no good reason. Oh, and we’re not done! Because the name Pong is political. The name Pong derives from ping-pong, which is a game with three other English-language names. One of them is pretty rare, Whiff-Whaff, and it’s from Britain and it’s mostly used by people who like to hold on to the history of the game and its origin in Britain. One of them is Table Tennis, which seems to spread pretty evenly across all the English-speaking Commonwealth nations. And then there’s Ping-Pong, which is what Americans tend to call it, which was the name associated with the trademarked product by Parker Bros. When you have three options that each speak to different groups and you pick one, you’re making a political choice. There’s almost no stakes to this political structure, of course. None of these choices are particularly vital, or were in many cases made to proactively change anything. They’re all almost entirely made to fit in with existing structures the creators worked within. That’s one of the things Politics is really good at – directing your behaviour to reinforce the status quo, so you don’t go about changing the way things have been set up. In fact, a lot of the time, politics does it so well you don’t even notice it’s doing it to you.